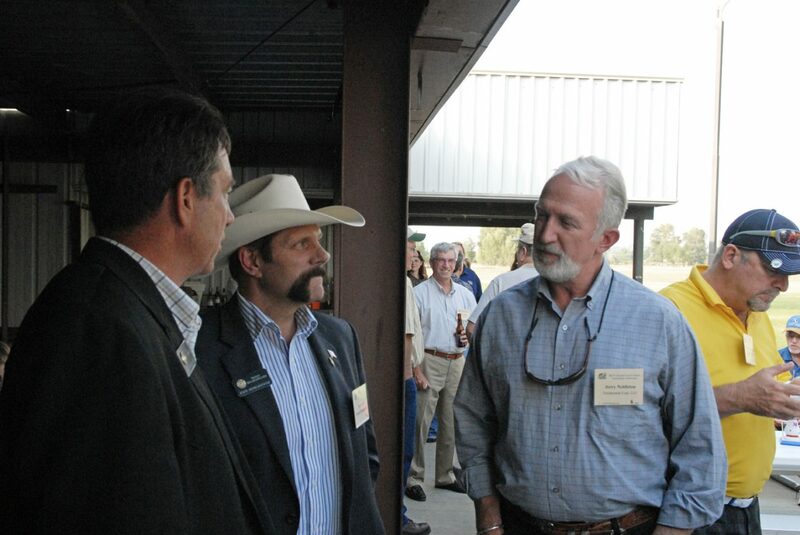 Jerry Nettleton, right, environmental manager at Twentymile Mine, chats Tuesday with state representatives Jerry Sonnenberg, left, and Randy Baumgardner, center, during the Colorado Coal & Power Generation Conference barbecue at Loudy-Simpson Park. On Tuesday morning Nettleton updated more than 70 people attending the conference about Twentymile’s future expansion into the Sage Creek reserve. Despite a sense of doom and gloom surrounding the coal mining industry due to increased government regulations, Twentymile Mine officials announced Tuesday they are pushing forward with plans to expand into their Sage Creek reserve. Twentymile, owned by St. Louis-based Peabody Energy, is Routt County’s largest employer and the top coal producer in the state. In 2011 Twentymile’s 480 employees, 60 percent of whom commute from Moffat County, mined 7.75 million tons of coal. But with reserves thinning at Peabody’s Twentymile Mine, located near Oak Creek, company officials last year made the decision to begin the expansion process into the Sage Creek reserve. On Tuesday Jerry Nettleton, environmental manager at Twentymile, highlighted the progress of that expansion for more than 70 people attending the Colorado Coal & Power Generation Conference at the Holiday Inn of Craig, 300 S. Colorado Highway 13. The Sage Creek reserve is located seven miles away from Twentymile Mine and holds an estimated 110 million tons of coal, Nettleton said. In 2011 Peabody initiated phase one of the Sage Creek expansion, which included the excavation of half a million cubic yards of surface debris to provide access to the coal seam. Employees also established utilities and constructed surface facilities at the new site. In May Peabody launched phase two of the expansion, employing a continuous miner to begin initial underground development of entry portals and longwall panels, Nettleton said. So far, crews have advanced 400 feet into the Sage Creek reserve and developed four points of entry. Phase two is expected to be completed in 2015, at which point the longwall, currently located at Twentymile, will be transported to Sage Creek to begin full-scale production, Nettleton said. But perhaps the most interesting aspect of the project, Nettleton said, has been working with the Routt County road and bridge department. Because Twentymile’s coal is transported to Hayden Station and other customers via an adjacent railway system, Peabody officials have elected not to relocate Twentymile’s coal washing plant. That means coal mined at the Sage Creek reserve would need to be transported to Twentymile for processing prior to customer delivery, Nettleton said. Though Peabody has conducted a feasibility study to build an overland conveyor system to transport Sage Creek coal to Twentymile, officials had been talking to the county about constructing an overpass to transport coal to Twentymile by truck. But county officials have elected instead to work with Peabody on upgrading already established county roads and have drawn up plans for a roundabout at Sage Creek. “From what I understand, I don’t know whether this is true or not, it is the largest roundabout in the world,” Nettleton said.